Yevez talks about Footbag, Peteca and sometimes other alternative sports, which means they're not in the mainstream. Yves Archambault's nickname, Yevez, is pushing people to move, whatever their age is. I worked part time all year on the video footage that I and my friend Cory filmed in Portland last year. Finally I am proud to announce that I released two video on demand albums on that particular tournament. Hope that you'll enjoy these 2 albums as much as I had fun to create them!!! There was some magic in the air at the Portland convention center yesterday. Everything finally fell into place and the feeling was fantastic. It will be a very important thing to reflect about having freestyle and net in the same room as disruptions from one another were constant. To the competition now; The first match of the day was for the Open doubles bronze medals. Luc Legault and Wiktor Debski took the first game of Team Finland by a score of 15-9 as they did in the semi finals against Ben Alston and Walt Houston. But as they did the day before their intention collapsed rapidly as the Finns were playing better and better. Matti Pohjola and Tuomas Karki took the second and third games 15-5, 15-6 to add yet another podium to their brilliant footbag lifetime achievements. This match was followed by the Women's doubles finals opposing team Europe Lena Mlakar and Kertsin Anhuth to team North America Geneviève Bousquet and Julie Symons. As in the previous match the momentum changed quite a few times in that bout. Team Europe took the first game 15-6 but the north americans came back in games 2 and 3 and won them 15-8 15-11 For Geneviève, who later that night got inducted in the Footbag Hall of Fame, it was a 6th doubles title and for Julie a whopping 12th in career. Julie jumped in at the last minute to replace Maude Landreville who had to have ear surgery just before Worlds and for this she couldn't fly. Symons didn't practice much in the last year and she was just planning to play masters double but she got her game back just in time and set Geneviève beautifully. Well done team North America! The next match is the most prestigious title in the Footbag Net World Open doubles. The favorites Benjamin Alston and Walt Houston were facing the second seeded team of François Depatie-Pelletier and Manu Bouchard. As expected Ben and Walt dominated, thanks to their big serves that François and Manu had the most difficult time to set properly and even completely missed at times. So a first doubles title at the World Footbag Championships for the Memphis team. Congrats, well played. This concludes my blog post for today, I'll post a recap soon, stay tuned! Howdy folks, how are you doing this morning? The 2017 Worlds is coming to an end very soon. Day 6 had a lot of important events but before I get in the details of the competition there's a few things that I need to say. First of all I think that the net part of the tournament lacks direction. I had to insist yesterday morning that we had a microphone on the main court. Without a push the players would have had to say their scores themselves again. Luckily this problem was solved halfway through the women singles finals and at least the net judge said the scores for the competitors. Later during the day, while open doubles semis were in full swing the music started on the freestyle side again, even if their finals were scheduled for 6:30 pm only. As well the free flow people were blasting their music in the main room with no consideration whatsoever for the competitors battling for the World title. One of the players, after repeatedly asking the freestyle producer to turn the music down. had to unplug the speakers and bring the volume to almost zero on the free flow circles blaster. The players on the court flew from Memphis, TN, Montreal, Qc and Poland. Please a little respect. On the men's side the 2016 title holder Walt Houston (USA) was trying to retain his title against Matti Pohjola (Finland). After Matti defeated his teammate Tuomas Karki in the semis I was afraid that he would have problems receiving Walt's service. Tuomas has to deal with quite a bit of Walt's serve in recent years and was doing pretty darn well in receiving in properly. 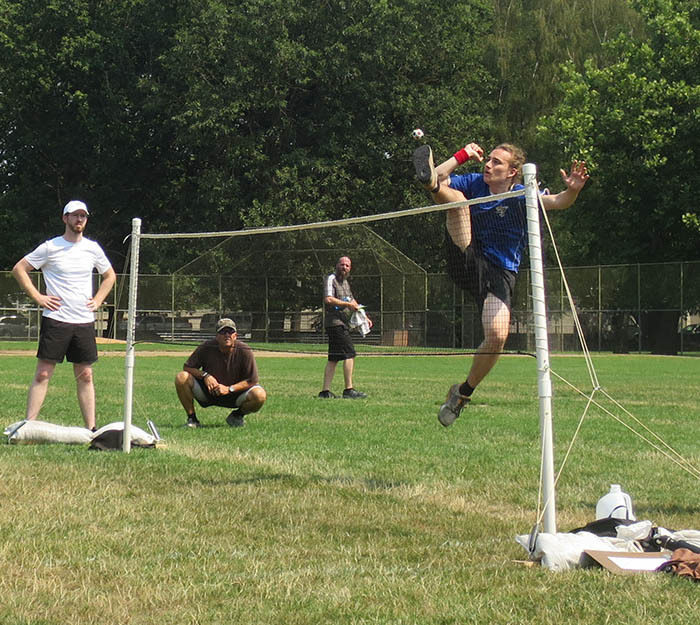 Matti was not ready to deal with the best service on the footbag net tour. This resulted in an easy win for Walt (15-6 15-11 15-10) who racks up a third world title in four years. The double semis are big crowd favorites as there is a lot of action, big spikes, digs and big running saves. These two matches brought the goods to the spectators in a big way. On the other side of the bracket it was a completely different story. Benjamin Alston and Walt Houston (USA) had their hands full with the team of Luc Legault (Aki Québec) and Wiktor Debski (Team Poland). Luc and Wiktor quickly demonstrated that they would not fold against the number one team. 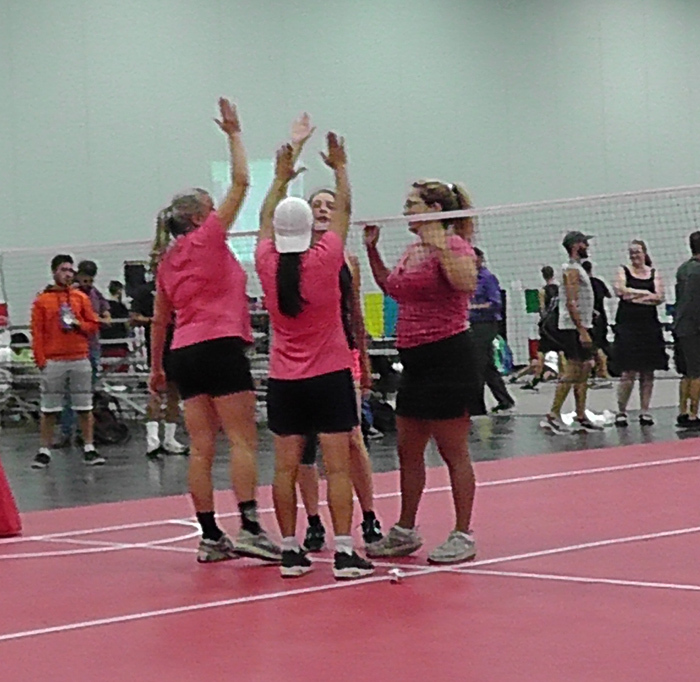 They rolled away with a 15-10 victory in the first set and a battle was set to unfold. Ben and Walt won the second set easily 15-4 as it seemed that Legault and Debski lost their concentration and agressiveness for a while. The third set was a battle and I'm sure that the Americans felt the pressure. In the end the combination of them having the best serves and the Polish-Quebec team's relatively weak offerings made the difference. 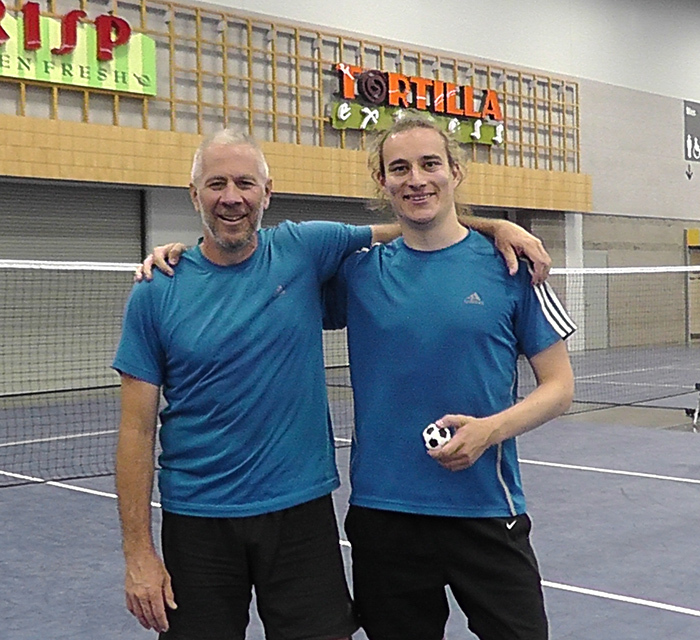 Walt and Ben won the third game 15-10 to make it to the finals at the World Footbag Championships for the first time. The match was nonetheless breathtaking, bravo to all the players. There was a lot of action on the Footbag Freestyle scene as well on day 6. The program invited us to watch the women's and open singles routines + the open circle finals. The women's field was small this year with only four competitors. Paloma Mayo, the winner of the 2015 title in Copenhagen was clearly the favorite and she dominated the group with her uniquely entertaining style and beautifully crafted routine. Cass Taylor and Caroline Birch pretty much dropped all over the place so they were no match for the champion. Congrats Paloma. In the open routines eight competitors were battling for the title. Surprisingly Pawel Nowak from Poland took the title over the legend, Vasek Klouda. He's probably still floating on a cloud this morning. It is a well deserved win as he executed his pretty difficult routine flawlessly and without a drop. Vasek had to face a technical glitch at the beginning of his routine as the organizers started the wrong tune for his performance. I can't wait for the day that this won't happen once in the freestyle finals, it seems to be an annoyingly resurging problem. How can it be so difficult to start the right music for the players???? This might have took some of Vasek's legendary concentration away as he dropped the bag once during his routine, probably costing him the title as the scores were extremely tight. Taishi Ishida stepped on the third stair of the podium with another dropless routine, very nice work Taishi. I also like TJ Boutorwick's routine, another dropless routine, if I'm not mistaken, to start the contest. Jim Penske's was also worth noting. The level is so hight these days that any of the 8 finalists has to push the limits very far. Speaking about pushing the limits what about the circle competition? This is a great display of virtuosity. The four players in the circle's finals are all virtuosos in my opinion although Nick Landes seemed a bit weaker than the 3 others. Vasek Klouda won it but I was extemely impressed by Lon Smith's crazy abilities + he seemed to be having the most fun. Lon second, Jim Penske 3rd and Nick Landes 4th. Fun to watch and probably discouraging to freestyle beginners? These guys are red hot and in full mastery of their craft. So now freestyle is over and there's one day left in the net competitions including the three doubles titles: women's, open and mixed. Lena Mlakar is in the women's doubles and the mixed finals and as she already caught the women singles title she could be looking at a tripe crown, a rare event in the footbag net world. François Depatie-Pelletier and Manu Bouchard in the open doubles. Let's hope that they bring back some gold to our beloved hometown! Today was a very frustrating day for me. Some semi finals at this World Championships were played without even having a microphone for the head judge to say the scores. The players had to say the scores themselves and as as spectator I couldn't hear them half of the time. There was music coming from the (very) neighboorhood of the freestyle competitions, practices and even old man rants about their glorious nostalgic days. All this while some players who came as far as Finland, Poland, Slovenia and Germany were on the court. (Matti Pohjola, Wiktor Debski, Lena Mlakar and Kerstin Anhuth. What's this???? Very unprofessional. I hope that tomorrow the freestyle warm ups won't blast away the genuine finals being played on the courts, but, at this point, I'm not very optimistic. So back to the events played on this 5th day of competition at the 2017 World Footbag Championships. The day started with 4 battles in the open singles division. Scheduled at 10 am. Walt Houston, Kenny Shults on one side of the bracket as well as Matti Pohjola and Tuomas Karki on the other made it to the semi finals. The 2 semis followed each other. In the first duel Matti Pohjola played very well to defeat Tuomas. He anticipated and dug some incredibly well placed spikes. Well done Matti. On the other side Walt Houston wanted to avenge his cousin and doubles partner. Ben Alston fell to Kenny Shults but Walt was not ready to shake. The holder of the title held it for at least one more round. The question now is: Can Matti control and return Walt's serve? We'll see this Friday who's the new king. The mixed doubles semi finals followed. My teammates Geneviève Bousquet and Luc Legault faced Evanne Lamarche and Kenny Shults in that all North American contest. The Aki Quebec representatives prevailed and are going to the grand finals on Saturday. Excellent! Go Montreal. The second semi finals featured an all European foursome. Lena Mlakar and Wiktor Debski won the long match that they played against Kerstin Anhuth helped by Matti Pohjola. Kerstin and Matti are multiple mixed title holders but Lena and Wiktor seemed even hungrier. This should be a good match. More news tomorrow, the first finals start at noon. Today we are approaching the most interesting parts of the tournament. In Open doubles the quarter finals didn't produce any upsets. Teams 1,2, 3 (easily) 4 (shakily) advanced to the semi finals. We will be in for a treat in the 2 vs 3 match as it is full of questions. Team number two is François Depatie-Pelletier and Manu Bouchard packing a little more offence playing the Finns Tuomas Karki and Matti Pohjola showing a little more regularity . I see that match as being more of a tight bout than the other. Team number four appeared shaky at best in their appearance vs Chris Siebert and Dan Greer. In fact it's kind of a miracle that they are still alive. Wiktor Debski (Poland) and Luc Legault (Montreal, Quebec) are not used to play together and they will meet the team with the biggest serves in the semi finals. Walt Houston and Benjamin Alston appear as clear favorites in this confrontation. They just won the Akisphere (Montreal annual tournament) and they have one more year of experience under their belt after finishing 3rd last year. As Walt also appears to be the grand favorite in open singles they will be exsuding confidence. Luc and Wiktor's serves are also below average it should be a walk in the park for the #1 seeded team. As for my predictions for the finals I'll reserve my judgement after the semis. In the women's singles category Lena Mlakar (Slovenia) scored a big upset over Geneviève Bousquet (Montreal, seed #1) There was also a bit of a controversy as to how this bracket was ran. Without being too technical something abnormal happened and will need further study for future tournaments. So no more Montreal representatives in the singles category. Geneviève still has to play in the Women doubles finals and the mixed doubles semis and hopefully finals. Otherwise the players are pushing the envelope more and more. In the freestyle world routines semi finals were on the menu today and the few echoes that I gathered are the following: Scott Bevier and Taishi Ishida went dropless during their presentation and Vasek Klouda was not satisfied with his performance. Which could be a good thing as he could even do better in the next round. Good luck to all the competitors for the next steps. This time I'll leave you with a picture of two legends of the sport who, each in their way redefined the game of Footbag Net and Footbag Freestyle. Left: Eric Bartholomay, AKA Bart great singles specialist brought his very dynamic, powerful and totally offfence minded game to the sport in the 1990's. Right: ''Rippin'' Rick Reese redefined a lot of the boundaries of footbag freestyle in the 80's and 90's with a combination of great difficulty in the moves and creativity in singles and doubles routines. One of the first real ''shredders', of the game. 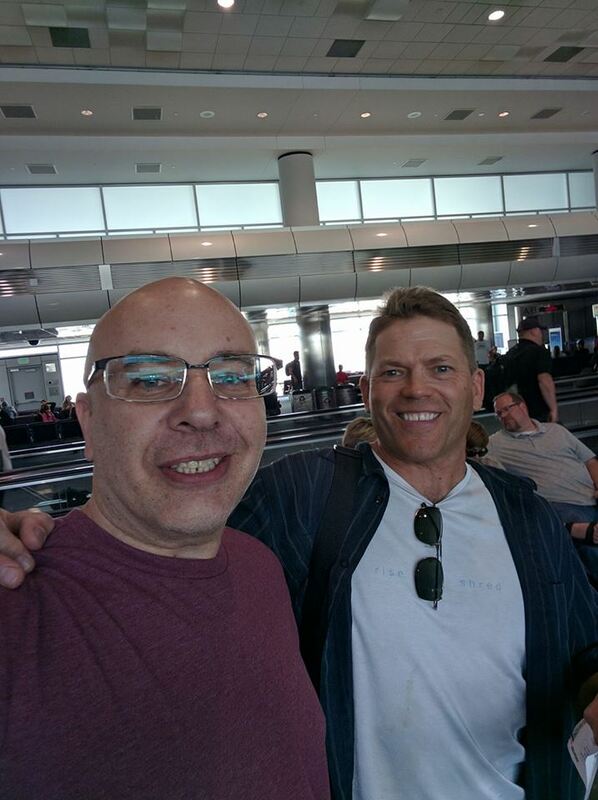 They met, I suppose at the Denver airport en route to Portland to see old friends and spectate with great interest. Lots more action to come, stay tuned. Hope you all had fun today! First I wanna talk about the Open doubles round of 16 results. My partner Santeri and I had an encounter with Luka Weyler-Lavallée and Russell Arseneault and we had a hell of a match. Final result: 11-910-1211-9 for them. At first I felt so dissapointed, of course, going to the quarter finals would have been a huge accomplishment for us. We came short a couple of points. They scored a total of 32 points in the match compared to our 30!!!!!!! The positive points are: We made the show and gave our all. Our match was so long that most of the other duels were done before we finished, so they gathered around and supported us. We ended up finishing 10th. OK. There was an upset also as team # 10, Jeremy Mirken and Dan Baron defeated #7 Grischa Tellenbach and David Bernard. The rest of the matches in that category were uneventful. In the women's doubles the finalists will be Geneviève Bousquet and Julie Symons versus Kerstin Anhuth and Lena Mlakar. North America vs Europe, I expect an enormous match. The 3rd place went to Evanne Lamarche teamed up with Becca English-Ross who outplayed Leanne Mackrow and Audrey Tumelin. Much honor to all the players and their family. Sitting on the chairs, from left to right: Tricia Sullivan-George, Julie Symons, Lisa McDaniel and Becca English-Ross. They are talking with 2015's Women singles routines champion Paloma Mayo. Power to the women. The men's doubles started at 1:15 and most of the matches ended up the way the organizers predicted, there was only one upset in Pool B where the team that was pre classified #3 beat team #2. No big surpises. In the women's doubles the pool had four teams and the team number two, Geneviève Bousquet (Aki Québec) and Julie Symons took the number one team. The Germano-Slovenian team of Kerstin Anhuth and Lena Mlakar seemed more affected by the conditions. High heat and, let's be honest, terrible courts. In the the next round (semi finals) the European team will have a tougher road than Bousquet and Symons. They will have to face Evanne Lamarche and Becca English, two seasoned veterans with lots of skills. So that's it for now, stay tuned, much more action to come.